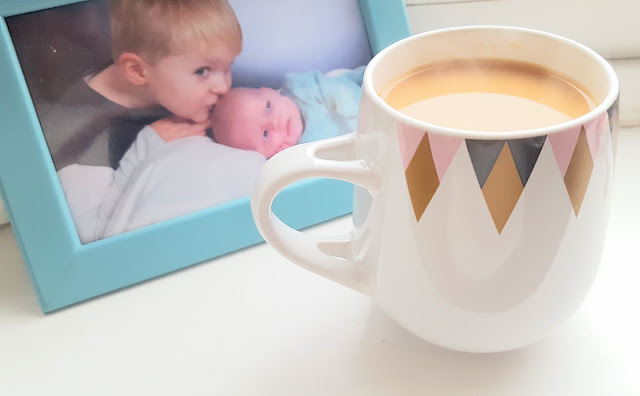 As a Fathers Day gift for Joe I was very kindly given an experience day from buyagift.co.uk. 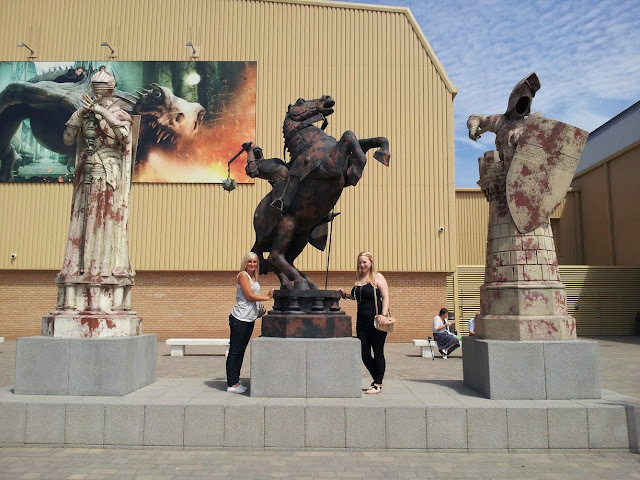 We have been wanting to attend the Warner Bros Harry Potter Studio Tour since the day it opened and it wasn't hard to make our choice from the website. 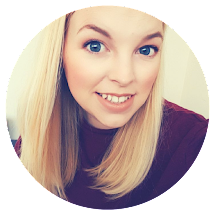 Unfortunately Joe had to work on the date we booked but I already had my stand in, my friend Vicky. So after a few weeks of counting down the days it finally came to the day of the tour! Starbucks at Newport Pagnell Services on the way down, I probably shouldn't have gone for decaf as my newly found Mummy Brain kept kicking in a few times...just one example is leaving the car engine running as I filled it with petrol...uhoh! But we finally made it down to Hertfordshire in one piece! 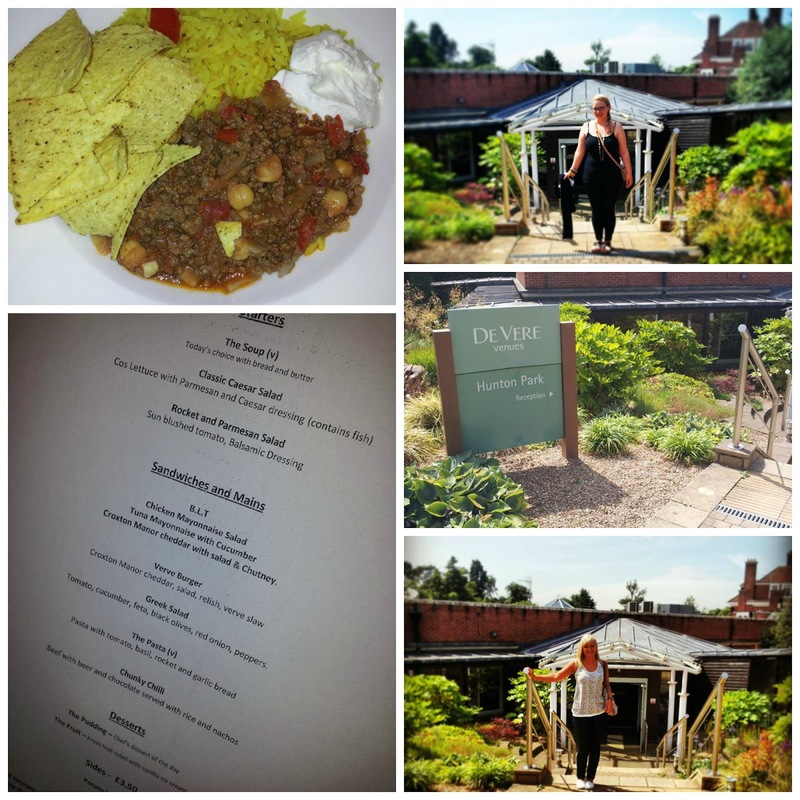 We headed straight to De Vere Hunton Park Hotel where we were met by lovely friendly staff who showed us to the complimentary tea and coffee and invited us to have a look around the grounds while the chef prepared our lunch. 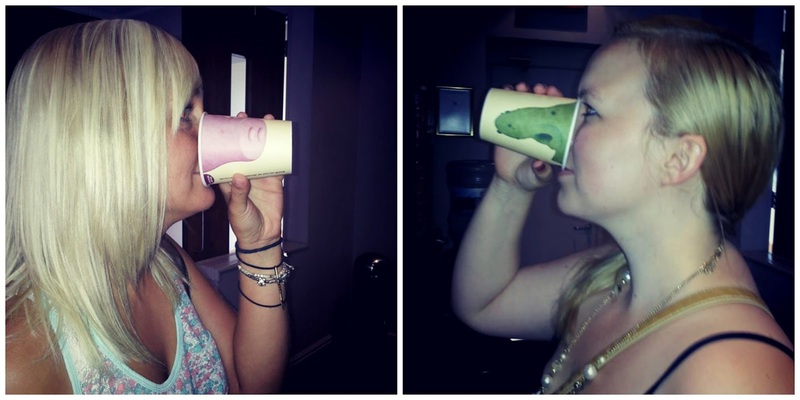 We discovered some really fun cups at the refreshments station and helped ourselves to some fruit tea. The hotel grounds are so pretty, I have even noted to look at it for a wedding venue! We were only waiting for 5 minutes when the waitress came and showed us to our table. The staff were so friendly and we had a great selection of courses to choose from. We both went for a Rocket, Parmesan and Sun Blushed Tomato salad followed by Chilli Con Carne. It was really tasty and I was pleasantly surprised at the quality of the food and the service. After lunch we took a little drive over to the Warner Bro's Studio's. We could have walked but it was really hot and neither of us wanted to walk around the tour after a sweaty 20 minute walk! We parked up and we were an hour and a half early so went for a look around, making sure not to miss out on any photo opportunities! The studio's look like a giant warehouse and it is hard to believe that there is so much magic behind those walls. But in we went with excited squeals! 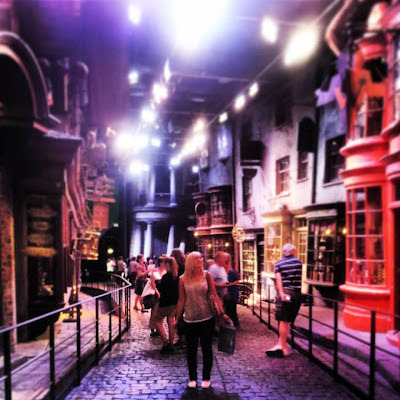 With time to waste we headed for the gift shop and what a gift shop it was, it was jam packed with memorabilia, dressing up costumes and replica props from the films not to mention the hundreds of sweets from Honeydukes sweet shop. We tried out the toy broomsticks, played with the owl puppets, attempted to be sorted into a house by the Sorting Hat (it didn't talk!) and dressed up in robes, I chose Slitherin...someone has to be the baddie! After exploring the gift shop we came out empty handed because it is quite expensive, it would have been nice to buy something little but at £7.95 for a chocolate frog it was out of my price range. We were still an hour early for our tour but the nice lady on the door let us in to the earlier tour, just goes to show you should always try your luck! 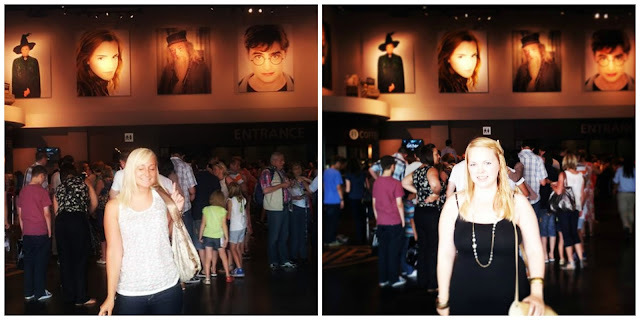 We were taken into a holding room and then into a cinema to watch the story of how Harry Potter went from J.K Rowling's words in the books to the amazing film's we have grown to love. Then it was on to the tour...there were a few exciting bits before we entered the tour that I won't ruin for people that are yet to visit! 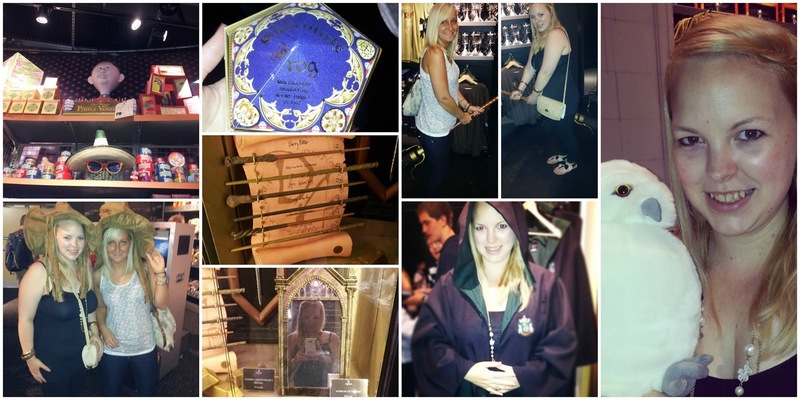 We were able to explore the studio's that were full to the brim with prop's, costumes and special effects. 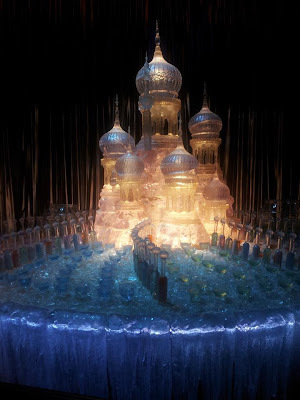 I especially liked the 'ice' sculpture from the Yule Ball from Goblet of Fire. It was beautiful, I heard a man next to me mention vodka which made me giggle. 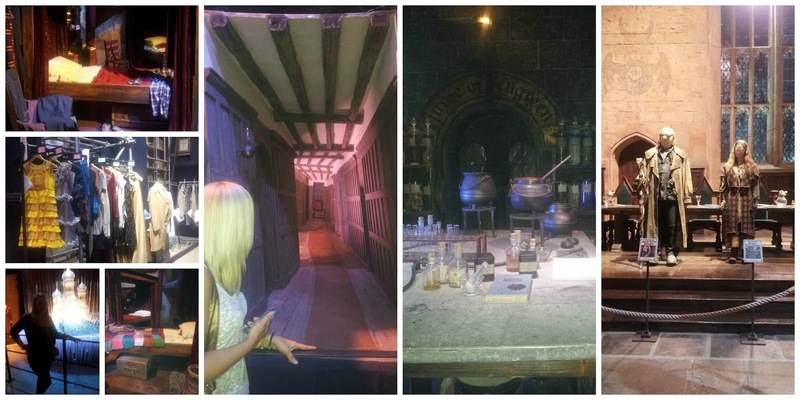 The sets from the films were all here from the Potions Room, The Griffindor Boys Dormitory, Hagrids Hut and Dumbledoors Office. They were exactly like in the films and I couldn't believe the attention to detail. We saw all of the wigs, costumes and make up used on set and there were interactive area's like The Weasley's House where you can wash magical pots and pans without touching them. We had a go on the green screens and I was able to practice my acting on a broom. It was appalling so we decided to just get a picture of ourselves in Ron's dad's car. This was all done by CGI we were in fact sat on a green chair and the car was added later! We saw the vehicles used on the film's, Privet Drive where Harry lived with the Dursleys and even the cupboard under the stairs. I loved standing on the bridge and was surprised at how rickety it was. There was even a stand selling Butterbeer but after our huge lunch we were still quite full. There was a brilliant area with all the creatures from the films. There was Dobby the House Elf, The Troll from the Girls Bathroom, Pygmypuff's, The Phoenix, Mandrakes, Muggles and Merpeople. My favourite though was Buckbeak the Hippogriff. 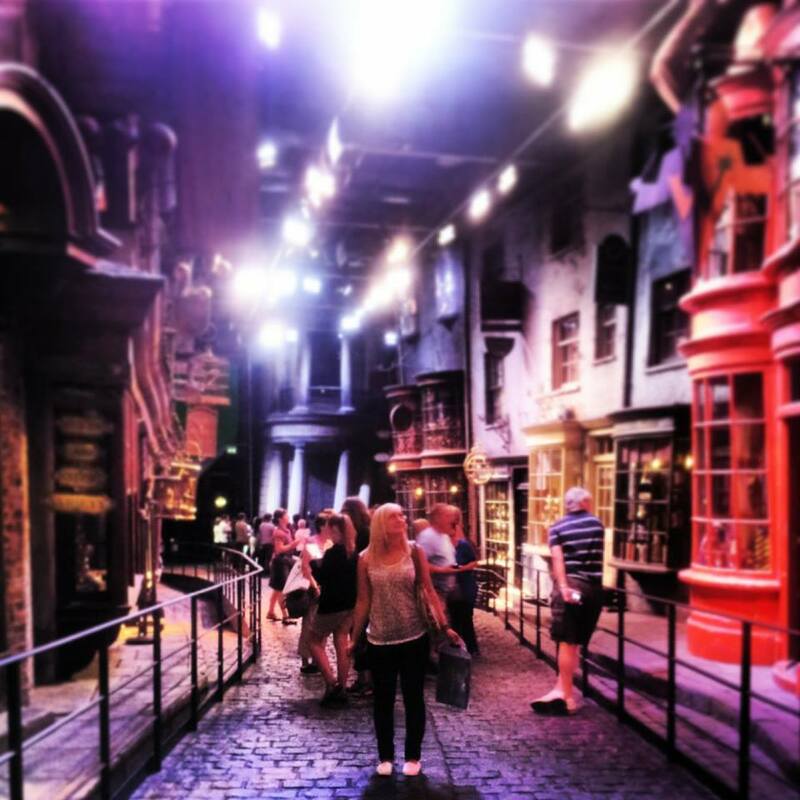 Next was Diagon Alley, unfortunately there was no enchanted brick wall we had to go through but it was all layed out as it was in the films, there were even a few shops I hadn't noticed before alongside famous ones like Olivanders, Wiseacres and Flourish and Blotts. Google Street View Here. Have fun exploring! 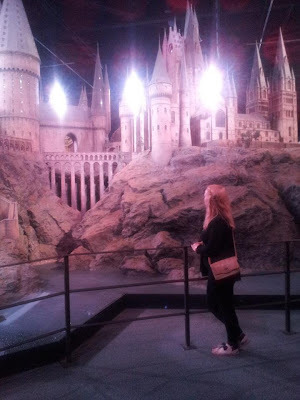 Then there was all the technical stuff, how everything was built, the set designs, architecture, models and art work that all went in to making the amazing Harry Potter film series. Some of the art work was fantastic, I would quite like some of the concept art in my house. Finally was the amazing model of Hogwarts which was used for filming the exterior shots of the castle in every movie. The detail is phenomenal, you can walk around the whole castle and from every angle it is incredible, even down to the smallest details like the 2,500 led lights that are made to look like torches being used inside the corridors. They even had a tiny owl in the owlery! 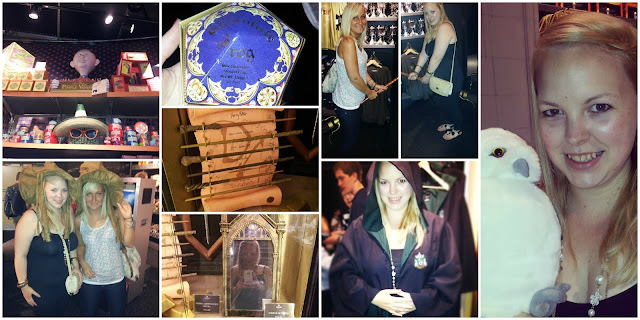 We ended the tour in a room full of wand boxes, stacked from floor to ceiling. 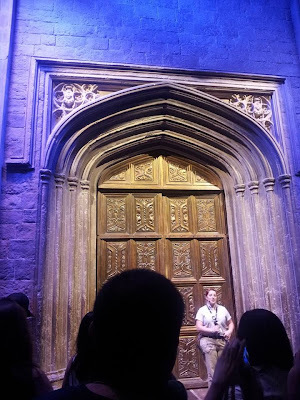 It was the set from inside Olivanders. This was the Tribute Room. Each of the boxes were named for every person that helped to create these wonderful films over the 10 years of filming. All of the cast, crew, costume designers, cameramen and even the caretaker has a box with their name on. Wow! Looks a fab day out!